QUICK! 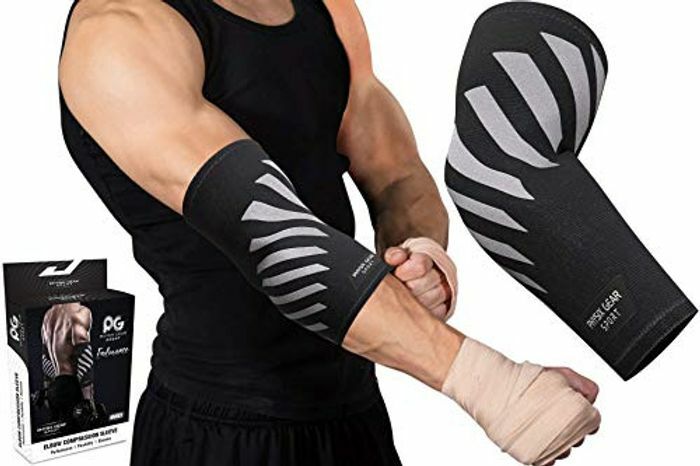 Elbow Support with Free Delivery!! Apply 80% off promotion to receive!!! D COMPRESSION AND RELIEF - Feel the immediate difference with fast pain relief and less stiffness. Physix Elbow Support Compression Sleeve improves circulation and secures support. Physix Tennis Elbow Brace applies even pressure across your elbow for prevention & recovery against tendonitis, inflammation, tennis elbow, golf elbow, & other elbow pains. With Physix sleeves you'll be able to tackle any activity with faster recovery, while ensuring you're a step ahead in injury prevention! DYNAMIC DESIGN - Professionally designed as the most complete Elbow Compression Sleeve Elbow brace for tendonitis for all fitness and sports enthusiasts anywhere. Durable Arm Brace, sturdy and long-lasting. Eliminates bunching and irritation for unrestricted movement and full-range of motion during physical activities. Perfect solution for tennis elbow treatment, golf, volleyball, football, basketball, baseball, crossfit, elbow sleeve weightlifting / powerlifting, and Golfers. ANTI-SLIP CONSTRUCTION - Intricate construction for absolute comfort. With smart stitching and moisture wicking features, this Compression Sleeve is built to let your skin breathe in peace without letting sweat buildup and cause nasty odour. Whether you've got meaty arms, or slender, we've got a fit for you! Our fabric weave provides the perfect form fit around your elbow, allowing you to benefit from support without suffering from Cubital Tunnel Elbow Braces that are too constricting. HIGH PERFORMANCE DURABILITY - No matter the sport or physical activity: tennis, basketball, baseball, golf, crossfit, or martial arts, get great confidence in knowing your elbow has the support to get you there. High-quality Neoprene Elbow Sleeve induces protection and improved blood circulation. Gives superior support, comfort, and relief without compromising your mobility. Get Durable joint stability regardless of activity while avoiding the itchiness common to neoprene supports. 100% RISK FREE PURCHASE- Physix Gear Sport is a truly remarkable company offering the best Elbow Brace Compression arm sleeve on the market. Buy with utmost confidence. If for any reason you aren't happy, simply contact us and we'll replace or refund the product for you. 100% risk free! Zero hassles, zero waits. Your satisfaction is our utmost focus. 'Add to Cart' now, join thousands of satisfied customers worldwide. Pain prevention and injury relief is only a button away. Can’t see the 80% off promotion box? once you select the size from the drop down bar the voucher will appear. Select the size require first. Then you see the 80% discount code comes up. Then colleccollectt the code before going to check out. That's a great price for this.Thanks for that one. Just ordered one for my elbow pain that I been suffering for since last 2 years.